Asos.com, the online fashion retailer, is to launch a Facebook shop at the end of this month that lets users purchase items from its entire product range from within the social network. Asos claims it is the first in Europe to open such a store, which will allow fans to buy its clothes without leaving the Facebook site. The online retailer has grown rapidly in recent years and says its website now attracts more than 11 million unique visitors a month. It will be hoping the new service will be a big hit with its Facebook followers, which, it says, number nearly 400,000. The Facebook app will have the same functionality as the Asos website, including add-to-basket, edit cart contents, check out and order-tracking features. It will also have increased social media capabilities including the ability to "like" and share items and purchases with friends. Items that are listed by users will also appear in their friends' newsfeeds, with the capability to click through to the Facebook store. The Facebook store has been developed by mobile technology Usablenet, which currently powers the Asos site. James Hart, ecommerce director at Asos, said: "Millions of our users already interact with Asos through Facebook, commenting on, sharing and discovering new items. "Many of those go on to buy something on one of our sites. Our Facebook Store will allow them to do this directly through Facebook." Asos, which launched in 2000, has 36,000 branded and own-label product lines across womenswear, menswear, footwear, accessories, jewellery and beauty, and claims to be adding 1,300 new product lines every week. In November last year, it launched two new sales platforms, Asos Marketplace and Fashion Finder, which sold designs by its customers and from small boutiques. 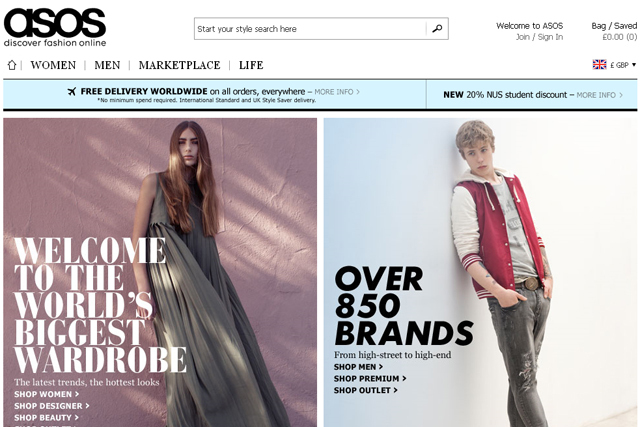 Asos rolled out a site in US in July last year.